Gabrielle Civil. Nov. 3, 2012. Charles Aznavour and chants for the lwa.Transformed suitcases. Memory loss. Dirt studies.Trying to recover. “Fugue” is a performance action in response to loss, diaspora identity and the 2010 earthquake in Haiti. It was inspired by work that Gabrielle did in a performance laboratory in Oaxaca, Mexico and “dirt studies” in Mexico City and Tlaxcala, Mexico in 2011. It was developed for the Haiti Culture Exchange ArtQuake event at the 5 Miles Gallery in Brooklyn, NY in December 2011. This will be the first time this work is shown in the Twin Cities. Gabrielle Civil is a black woman poet, conceptual and performance artist, originally from Detroit, MI. Her recent work includes “*anemone,” premiered at Pleasure Rebel in May 2012 and “(___) doesn’t know (___) own beauty,” a collaboration with Moe Lionel in July 2012. 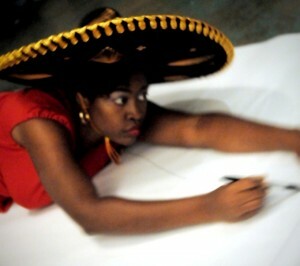 This fall, she will launch her catalogue In and Out of Place: Making Black Feminist Performance Art in Mexico. Her Late Nite piece “Fugue” is a meditation on diasporic identity, loss and the 2010 earthquake in Haiti. The aim of her work is to open up space. Announcing our 2013 Mainstage Season!